In a small saucepan, heat the 1 tablespoon of oil. Add the shallot and garlic; cook over moderate heat, stirring, until softened, about 3 minutes. Add the cherries, sugar, vinegar, miso, mustard and 1/2 cup of water; bring to a boil. Simmer over moderate heat, stirring occasionally, until the cherries are coated in a sauce, about 8 minutes. Season with salt and pepper. Scrape into a bowl and let cool; stir in a little water if too thick. Heat a large cast-iron skillet. Brush the pork with oil and season generously with salt and pepper. Add the pork to the skillet and cook over moderate heat, turning once, until browned and an instant-read thermometer inserted in each piece near the bone registers 135°, 12 to 15 minutes. 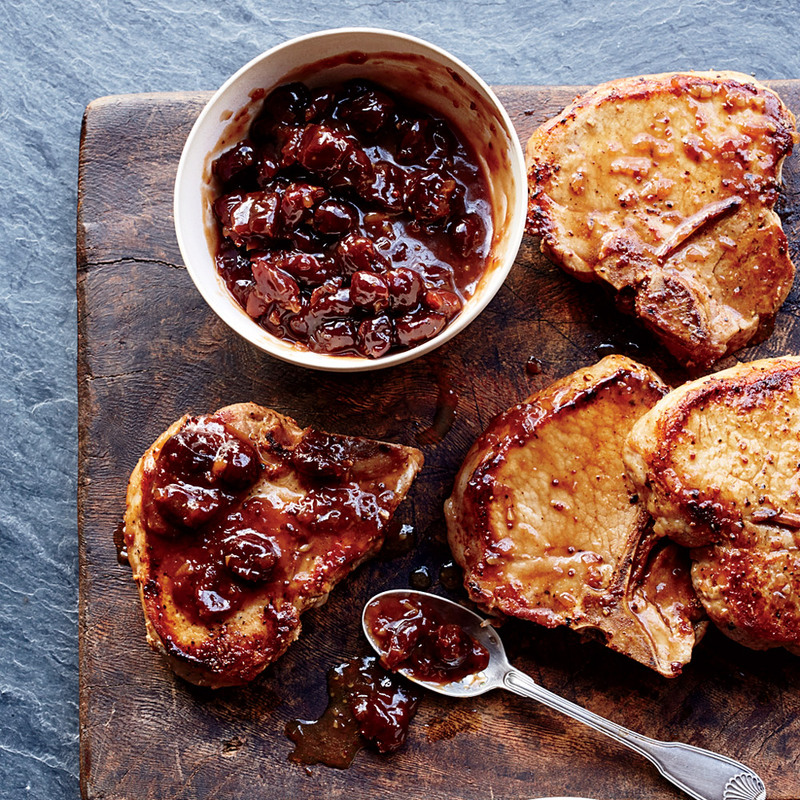 Transfer the pork chops to plates or a platter and let rest for 5 minutes. Serve with the mostarda. The cherry-miso mostarda can be refrigerated for up to 5 days. Bring to room temperature before serving. Review Body: I looked up the recipe 2 days ago and cooked it last night. The overall outcome was amazing! Review Body: OMG, the picture sold me. I will be cooking this meal tonight, will let you know how the recipe tasted like!